Nanoparticle assemblies can be investigated in 3 dimensions using electron tomography. However, it is not straightforward to obtain quantitative information such as the number of particles or their relative position. This becomes particularly difficult when the number of particles increases. We propose a novel approach in which prior information on the shape of the individual particles is exploited. It improves the quality of the reconstruction of these complex assemblies significantly. 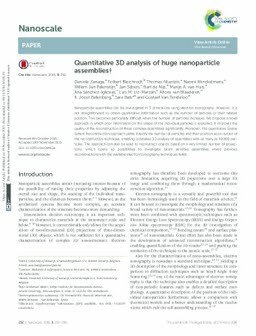 Moreover, this quantitative Sparse Sphere Reconstruction approach yields directly the number of particles and their position as an output of the reconstruction technique, enabling a detailed 3D analysis of assemblies with as many as 10 000 particles. The approach can also be used to reconstruct objects based on a very limited number of projections, which opens up possibilities to investigate beam sensitive assemblies where previous reconstructions with the available electron tomography techniques failed.